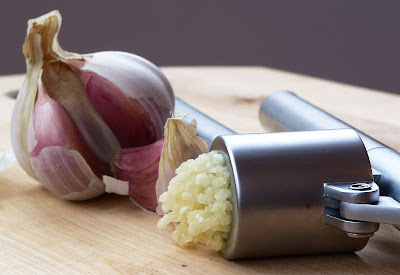 This is definitely not the recipe for those of you that hate garlic, but for us that cannot get enough of the stuff it is pure heaven. Garlic on all channels, on TV, radio, newspaper, and internet - simultaneously - and it is in smellovision, tastovision, and stereosound. Chicken with garlic in the butter, in the cavity and mixed into the vegetables. If this does not scare vampires and evil spirits out of hell, nothing will. Mix butter, herbs, and 5 cloves of finely chopped garlic. Allow to infuse in room temperature for one hour. Place chicken in a large baking tray. Put whole cloves from one whole bulb in cavity, do not remove skin. Chop the two other bulbs in two, place them with the cut side down besides the bird. This will enable the garlic to soak up liquid from the tray for extra aroma. Pour a little olive oil over the garlic. Spread the garlic butter equally on the breast, and thighs. 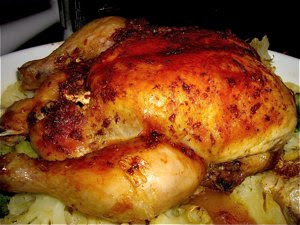 Place the chicken in a very low oven (100C/215F), and bake for 3 hours. Baist with excess liquid if necessary. Take out chicken. Place broccoli and cauliflower on tray, place chicken back on the vegetables. Put the chicken in the oven for another hour. Rise the temperature to 200 C / 400F the last 20 minutes to get a crisp skin. Allow the bird to rest for 10 minutes before serving. Pour excess liquid in pan in a pot. Add dijon mustard and cream and allow to simmer for 5 minutes. Serve with roasted potatoes or rice and the mustard sauce.